Goldilocks-Investing.com has changed its name to Muscular Portfolios. All of your old links will automatically forward to the correct page at the new domain. But now is a good time to update the bookmarks in your browser. Our book, Muscular Portfolios, is still in stealth mode, but steady progress is being made to release the finished work by November 2017. Stay tuned! Users of Muscular Portfolios choose a single day each month to check the website and give their holdings a tune-up, if need be. This doesn't have to take place on the first trading day of each month. Do it on any day that's convenient for you and easy to remember. For details on how Muscular Portfolios work, see our May 2, 2016, newsletter. The following exchange-traded fund (ETF) ratings were calculated at the close of the market on Dec. 30, 2016. The numbers are refreshed every 10 minutes during market hours at the Muscular Portfolios website. There are separate pages for the Mama Bear, the Papa Bear, and the Baby Bear. The Baby Bear is not a Muscular Portfolio. It's a simple, starter portfolio for people with less than $10,000 of savings. The Baby Bear holds only two ETFs — VTI (all US stocks) and BND (all US bonds) — in a 50/50 proportion, rebalanced once per year. Muscular Portfolios did fine in 2016. Let's take a look at our investing principles and how they worked out in specific portfolios last year — with a glimpse of the year to come. Most average investors — what I call "armchair investors" — create portfolios that are way too tame or way too risky. The typical person keeps 65% of investable savings in plain old cash, earning very little, according to a PDF by BlackRock Investor Pulse. At the other extreme, about 25% of Americans who own IRAs bet their entire wad on stocks, says the Investment Company Institute. The problem is that a stock-only portfolio is certain to lose 30%, 40%, 50% or more in a crash every few years. That compels people to liquidate their holdings and lock in their losses. Muscular Portfolios offer a better way. They're financial strategies that are designed to never lose more than 25% — usually far less — even in a major global crash, such as 2008. "Informed investors" remain fully invested in classes of assets that are in uptrends, as determined by mechanical strategy rules that require no guesswork. This principle takes advantage of an unusual financial relationship. 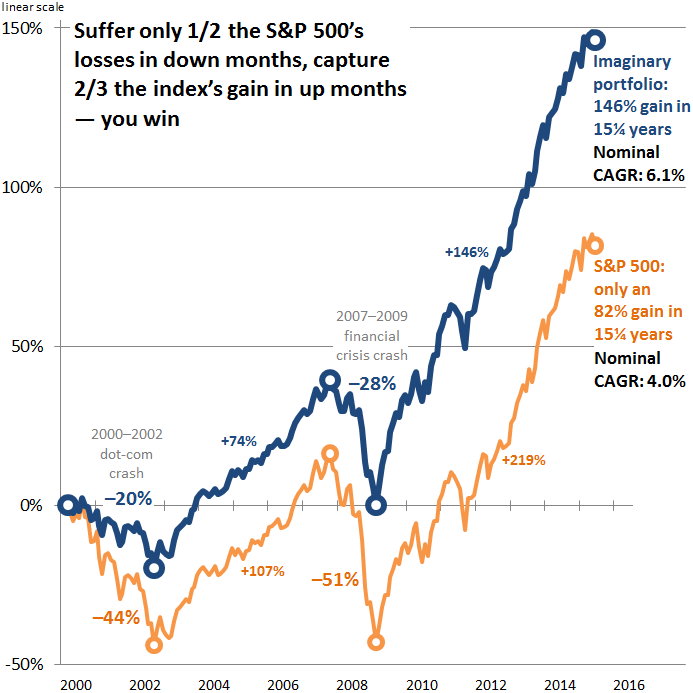 Most traders and speculators try to beat the S&P 500 every year or even every month. Unfortunately for them, there's no formula that guarantees that kind of outperformance. The S&P is often the strongest market index — hard to surpass, when it's soaring. If there were an "always beat it" trick, it would quickly be programmed into high-powered trading computers. The formula would become overused, and the behavior would quickly disappear. What actually works is to do the opposite of what most traders do. Informed investors make money over the long term. They allow their portfolios to lag the S&P 500 during screaming bull markets. They know they'll make it all up — and more — because the index inevitably crashes every ten years or so. Figure 1 shows this principle using a theoretical portfolio. Imagine that you could keep your losses under 1/2 of the S&P 500 when it's down. This is easily achieveable with a Muscular Portfolio. After a down period, you could exceed the index over time by gaining only 2/3 as much in months when it's up. There's no need for you to take on wild levels of risk. Muscular Portfolios take advantage of a hard-wired aspect of human nature. Most people buy when the market is exciting and sell when the market is scary. That's the classic formula for buying high and selling low. • A Muscular Portfolio will tend to grow about 2/3 as much as the S&P 500 during each bull market. • But the portfolio will tend to lose only 1/2 as much as the S&P 500 during each bear market. • The result — when measured over a complete bear-bull market cycle, the shortest period of time that you should evaluate investing strategies — is that the portfolio will tend to outperform the crash-prone, stock-only index. Figure 2 shows the actual performance of a real-money account that tracked the Mama Bear Portfolio during all of calendar year 2016, according to FolioInvesting.com. Notice that the Mama Bear lost only 3% in January–February, while the S&P 500 fell a gut-wrenching 11%. Partly due to that head start, the Mama Bear stayed ahead of the S&P 500 for the first 10 months of the year. Only in the last two months did a post-election surge drive the index temporarily higher. Figure 2. 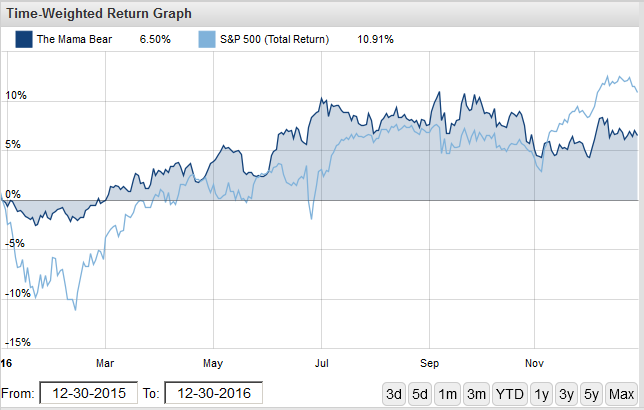 The Mama Bear (dark blue) stayed ahead of the S&P 500 during the first 10 months of 2016. Only in the last two months of the year did the index race ahead, but the Mama Bear will tend to pass it in the bear market that's sure to come. This is a good time to get clear about your goals. Are you a speculator who seeks quick profits? (Most people will never "win the lottery" in the treacherous markets.) Or are you a long-term investor who just wants your savings to grow strongly over your lifetime? • If you looked at Figure 2 and said, "I couldn't stand it if my portfolio fell behind in the last two months of the year," you should use this as a learning opportunity. Making your savings grow comes from patience and following a reasonable plan, not from trying to beat the market every year. • If you said, "I don't care what the S&P 500 does, so long as my money grows," you have the right attitude to win in the long term. While others grasp at 1-in-100 bets in vain attempts at profits, you can outperform by using a simple formula that circumvents human nature. 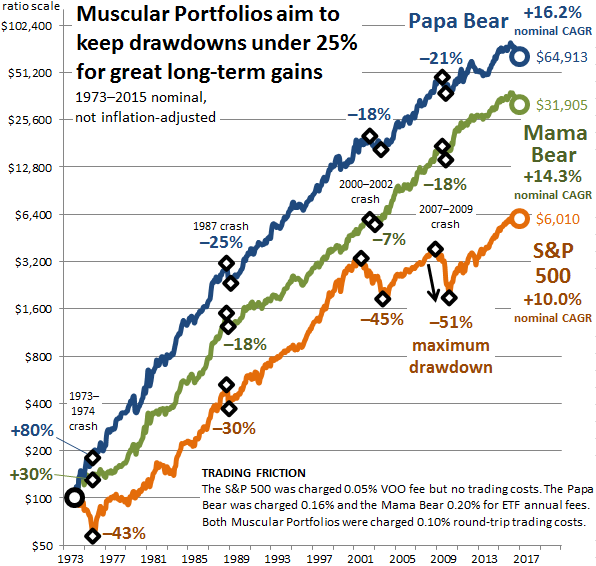 The Mama Bear's fellow Muscular Portfolio, the Papa Bear, was introduced in this newsletter very recently: May 2, 2016. Eight months isn't nearly long enough to evaluate the Papa Bear or any other investing strategy. However, if you're curious, the Papa Bear also lagged the S&P 500. Since the close of the market on May 2, the Papa Bear earned 0.6%, while the S&P 500 earned 9.2%. Does a difference as small as 8.6 percentage points in eight months bother you? lt shouldn't. Every investing formula will pull ahead and then fall behind any index you happen to choose as a benchmark. It's only in the long run that we see who's won — with steady growth — and who's fallen victim to one crash after another. Figure 3 illustrates why I'm so excited about Muscular Portfolios. It's not necessary for you to load up on risky assets, which Wall Street constantly promotes. You increase your gains by reducing your risk! Simply using a mechanical formula to remain 100% invested in whichever assets are in uptrends — the opposite of what most people do — you can enjoy watching your savings grow strongly over time. Figure 3. The S&P 500 has crashed 30% to 50% four times in 43 years. Muscular Portfolios use a mechanical formula to keep their losses small. That lets them achieve a long-term CAGR (compound annual growth rate) that's 4 to 6 percentage points higher in simulations — without trying to beat the index during bull markets. Source: Quant backtester by The Idea Farm. If you've read this far, your reward is a downloadable layout of "The Tale of Goldilocks and the Three Bankers." This is the first two pages of the very first section of the book. If you missed any of our previous newsletters, links to them can be found in the lower-right corner of our home page. Anyone may sign up at the Muscular Portfolios home page to receive this newsletter. About the author: Brian Livingston is the author of the forthcoming book Muscular Portfolios (November 2017). He is also the co-author of 11 books in the Windows Secrets series, 1991–2007 (John Wiley & Sons), with over 2.5 million copies sold. From 1986 to 1991, he worked in New York City as assistant IT manager of UBS Securities; a consultant for Morgan Guaranty Trust (now JPMorgan Chase); and technology adviser for Lazard Frères (now Lazard Ltd.). He was the weekly Windows columnist for InfoWorld magazine from 1991 to 2003. During portions of that period, he was also a contributing editor of CNET, PC World, eWeek, PC/Computing, Datamation, and Windows magazine. In 2003, he founded the Windows Secrets Newsletter, which grew from zero to 400,000 email subscribers. He served as its editorial director until he sold the business in 2010. He is currently president of the Seattle regional chapter of the American Association of Individual Investors (AAII). This newsletter and our other publications are protected by copyright law. The terms Muscular Portfolios, Mama Bear Portfolio, Papa Bear Portfolio, and Baby Bear Portfolio are registered trademarks of Publica Press. The term Publica Press and related designs are trademarks and service marks of Publica Press. Other parties' copyrights, trademarks, and service marks are the property of their respective owners. You may print a copy of the information for your personal use only, but you may not reproduce or distribute the information to others without prior written permission from us. This newsletter and the information contained herein are impersonal and do not provide individualized advice or recommendations for any specific subscriber or portfolio. Investing involves substantial risk. Neither the publisher of this newsletter, its authors, nor any of their respective affiliates make any guarantee or other promise as to any results that may be obtained from using the newsletter. While past performance may be analyzed in the newsletter, past performance should not be considered indicative of future performance. No reader should make any investment decision without first consulting his or her own personal financial adviser and conducting his or her own research and due diligence, including carefully reviewing the prospectus and other public filings of the issuer. To the maximum extent permitted by law, each author, the publisher, and their respective affiliates disclaim any and all liability in the event any information, commentary, analysis, opinions, advice and/or recommendations in the newsletter prove to be inaccurate, incomplete, or unreliable, or result in any investment or other losses. The newsletter’s commentary, analysis, opinions, advice, and recommendations represent the personal and subjective views of the authors, and are subject to change at any time without notice. Some of the information provided in the newsletter is obtained from sources which the authors believe to be reliable. However, the authors have not independently verified or otherwise investigated all such information. Neither the publisher, its authors, nor any of their respective affiliates guarantee the accuracy or completeness of any such information. Neither the publisher, its authors, nor any of their respective affiliates are responsible for any errors or omissions in this newsletter. Copyright © 2017 Publica Press. All rights reserved.